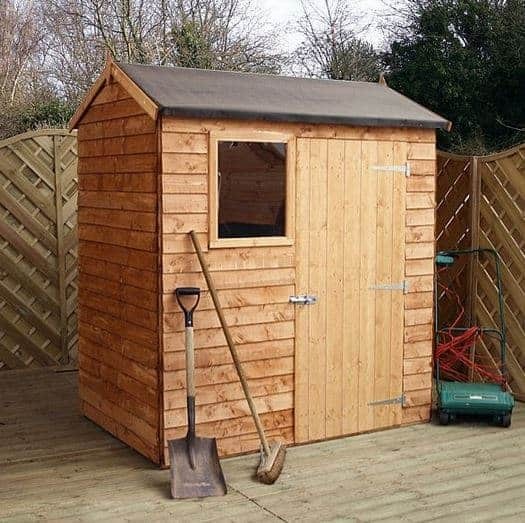 This 6 x 4 reverse apex wooden shed with overlap cladding is a good example of practicality in the garden. The reverse aspect means that you have more breathing room when you are considering the installation, and the apex roof means that you also have plenty of room inside the building. There is solid sheet material in the roof and the floor, and this helps to make for a building that can withstand issues like damp and rot. Now this is a nice little compact shed that is just so incredibly practical for your storage needs, but as far as a first impression goes. This is the type of shed where you will not be mind blown because of the sheer size of it, but it is the type of shed where once you have built it, you will take your step back and we are sure that you will nod your head and give out an approving hmm or grunt….. if grunting is more your thing. It just looks like such a solid shed and that apex roof lets you know right away that when it rains as it does for what seems like ¾ of the year, no water will be getting in that roof. Speaking of keeping the water at bay that overlap cladding which catches your eye with just how nice it looks will also be sure to keep the rain out! That little window (made from 2.5 mm styrene by the way) really does give the shed some extra personality and a hanging basket off one of the corner is just one of a few ways we have seen people really make this shed their own. We were very happy with just how nice this shed looked when it was fully built it really does have a sturdy and tough kind of look to it, but at the same time it is not to “tough” that it would look out of place in a nice “flowery” type of garden. Some people write off smaller sized sheds without taking the time to really research them…. Well we will make sure you guys know if this is the type of shed that will fit in your garden and make sure that you are aware of just how much bang you are getting for your buck. 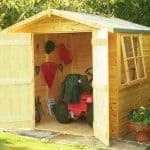 It is clear that this is a very compact shed, but this is a shed that offers you just enough storage space to keep things like your mower, tools, gardening gear or whatever out of the elements. What the shed lacks in depth it does make up for in height and with some clever use of shelving you can really maximise this space. 6 X 4 Walton’s Reverse Overlap Apex Shed: How easy to build? Many people will tell you that building a smaller scale shed is a lot easier than building some big huge monster of a shed…… and we would have to kind of agree. We will not lie and tell you that just because a shed is on the small scale of the shed spectrum (is there even such a thing as the shed spectrum?) and tell you that it will be all nice and easy…… but being smaller means that there is less, let’s just say mass to worry about holding up while you screw something else in. Still we always recommend having a friend with you to help build the shed as this always makes things that little bit more easier and fun. Your shed will arrive flat packed and to be honest when it is all laid out on the floor along with the screws it does not look all that much of a daunting task. We would say that even someone with not a great deal of DIY experience would be able to put this together in about five hours. 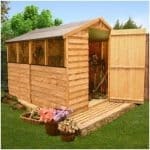 6 X 4 Walton’s Reverse Overlap Apex Shed: How Safe & Sturdy Is The Shed? With the Walton’s name on this you know that you are getting a very strong shed. 8 mm cladding not only makes this shed very nice to look at, but it also means that the rain just runs right off it and there is no danger of it getting inside and spoiling all of your stuff. The cladding along with the double framed corners really do make this a shed that would take a slap from the Incredible Hulk and barely move an inch! As is the standard with Walton’s shed the roof and the flooring is made with solid sheet board. The roof is 8 mm thick and is resistance against rotting, but as it is covered in some rather thick sand felt covering, you are not going to have any issues of water getting in through the roof. While this is a smaller shed, Walton’s still use their 10 mm thick flooring which is very string and sits on some nice and sturdy floor joists. We honestly have no issues with the shed when it comes to the build quality. 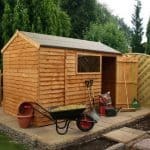 This is a shed that will be a staple in your garden for years and years to come and will look great the whole time as well. The 8 mm cladding along with those double framed corners really do make this a shed that if you have kids or grandkids running around the garden using your shed as a base, goals or some other thing that gives them a reason to hit it or throw a ball off it, that it will still be standing strong…….. after they have thankfully left the garden! 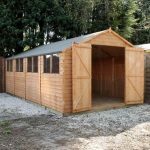 6 X 4 Walton’s Reverse Overlap Apex Shed: What Is The Guarantee Like? 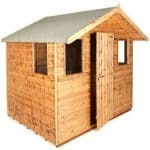 You get a ten year guarantee with this shed like you do other Walton’s sheds. This is one of the things that we love about their sheds, but we will warn you that you are responsible for treating your shed with the right kind of paint in order to make this ten year guarantee valid. We really do love this little shed. Walton’s do have a much larger 10 X 6 version of this shed, but not everyone has the garden space or even the need to have a shed that size. This one here is perfect for you people who just want a shed that is practical to store a few things in and look good doing it. 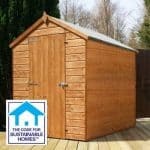 Coming in at just over £200 and being relatively easy to put together make this a great shed if you are on the lookout for a shed that is really practical and is not going to break the bank.